This project was completed in six stages over an 18 month period, which included hoist take down/ removal from site, remote refurbishment in our workshops, installation, load testing & commissioning of the equipment. These six automatically controlled Globe air powered wire rope hoist units had been in service since the late 1970s and initially H&W Ltd was asked to quote for complete replacement of all hoists. However due to very high costs of new equipment and budget restraints, H&W Ltd proposed a complete overhaul of all equipment, which saved the customer approximately 80% in costs compared to the new replacement hoists. 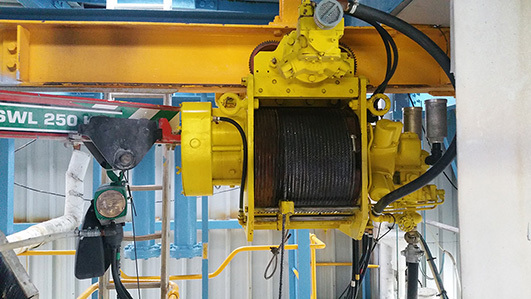 The original wire rope hoist had been subjected to a very aggressive coastal atmosphere, which had caused severe corrosion to all external parts, and contamination to key components such as wire ropes, pendant controls, controls valves, overload devices and air management systems. 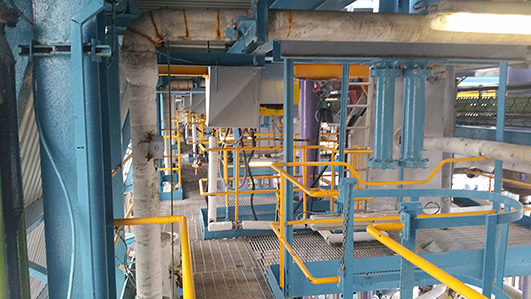 After agreeing costs and a programme whereby one air hoist at a time was refurbished in such a way as not to disrupt production, the initial hoist was removed and a temporary air chain hoist put in its place. Each original Globe wire rope hoist weighed approximately 500 kg and was taken down to ground floor level and removed from site by the H&W Engineering team. The removal of the original wire rope hoists was carried out using 2 off Yale manual chain blocks and 1 off “T “ Bar design lifting frame clipped to the top flange of the hoist runway beam. - New improved heavy duty brass control pendant hand set and control hoses which offered single speed control for both hoist and travel motors. 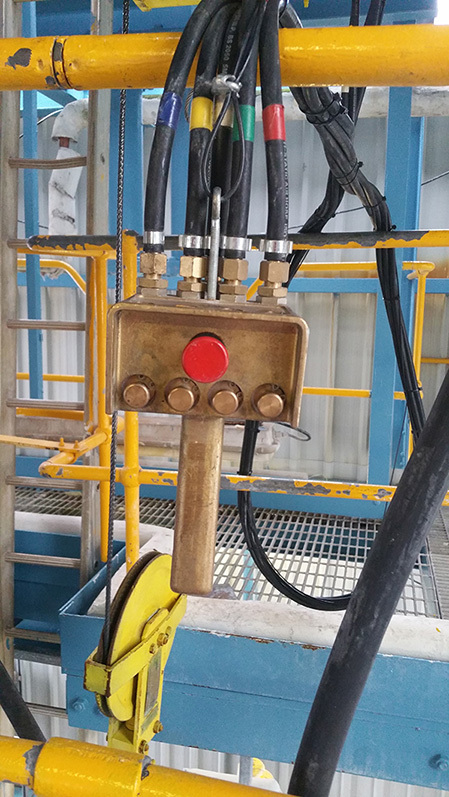 - Full re–paint of the hoist unit external components with a corrosion resistant epoxy based bright yellow paint finish as shown in the photograph. In some cases, the original hoist rope drums and rope guides were refurbished by a process of welding to rebuild worn material areas and then machining to regain the original form. In house load test to 500 kg + 125% proof load test was carried out at Hoist & Winch Ltd premises to confirm full load lifting capability before return to site for installation. On completion, Hoist & Winch Ltd issued a LOLER Thorough Examination Report for the completed air powered wire rope hoist installation work. This was a challenging project due to the age of the equipment, condition and limited availability of new replacement spare parts. The pharmaceutical and coastal conditions and resulting closely monitored working practices called for very stringent planning of all work activities. Therefore, all on site work had to be very carefully documented with risk assessments and method statements, which were reviewed and agreed by the site engineers before any work commenced.